Note: We're planning a birthday picnic in honor of Veblen's 138th birthday on Sunday, June 24, 2pm. Details upcoming. Oswald Veblen made the cover of the May 16 Princeton Alumni Weekly, looking confident and ready to change the world. At Herrontown Woods, we know him as the man who with his wife Elizabeth acquired and then donated 100 acres for Princeton's first nature preserve back in 1957. 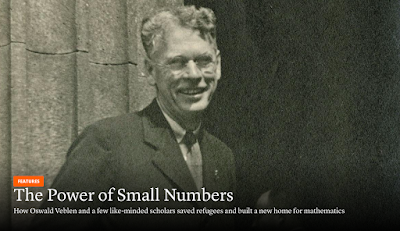 But while Veblen was acquiring and preserving open space in Princeton, he was also saving lives and careers, and in the process helping to make the U.S. ascendent in the world of mathematics. 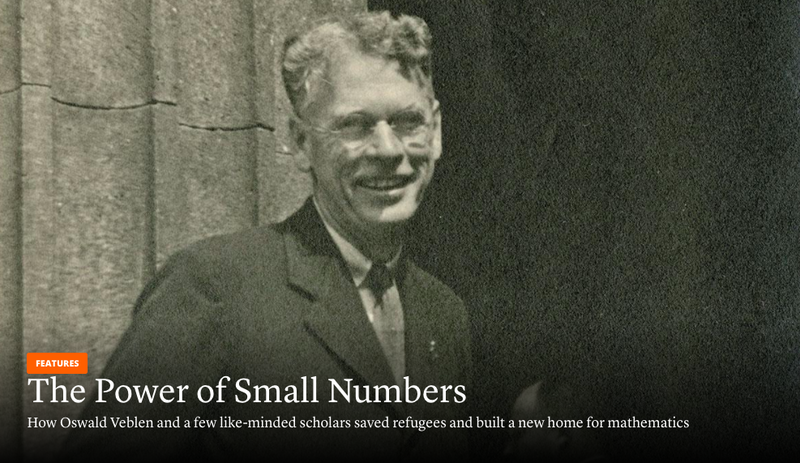 The feature article, written by Elyse Graham of Stonybrook University, tells of his tireless work in the 1930s and 1940s to find positions in the U.S. for European scholars whose careers and lives were imperiled by the Nazi rise. Graham alludes to Veblen's many other contributions to Princeton and the world--his key roles in designing the extraordinary (Old) Fine Hall for mathematics on campus, bringing the Institute for Advanced Study to Princeton, and supporting the construction of early computers. This photo was taken in 1936, the same year Veblen acquired the farm cottage at Herrontown Woods to use as his study. That acquisition could be considered the beginning of Princeton's open space movement. There's been a gradual rediscovery of Veblen's quiet but deep legacy, beginning with the recognition at the 2012 Turing Centennial Celebration of his role in early computer development. George Dyson devoted a chapter to Veblen in his book, Turing's Cathedral, and delivered a talk entitled "The Institute for Advanced Study: the First 100 Years," in which he gave emphasis to the visionary influence not only of Oswald Veblen but also of his economist uncle Thorstein Veblen. and in 2017, a History Working Group at the Institute published an article crediting Veblen with overcoming director Flexner's hesitation and making the IAS a sanctuary that would welcome displaced foreign scholars. An exhibit by the IAS History Working Group was placed in the hallway of Fuld Hall, including Veblen's role in finding a position for the great female mathematician, Emmy Noether. These are welcome though likely temporary additions to the exhibit at Fuld Hall, which has long offered a simplified narrative that focused on founder and first director, Abraham Flexner. 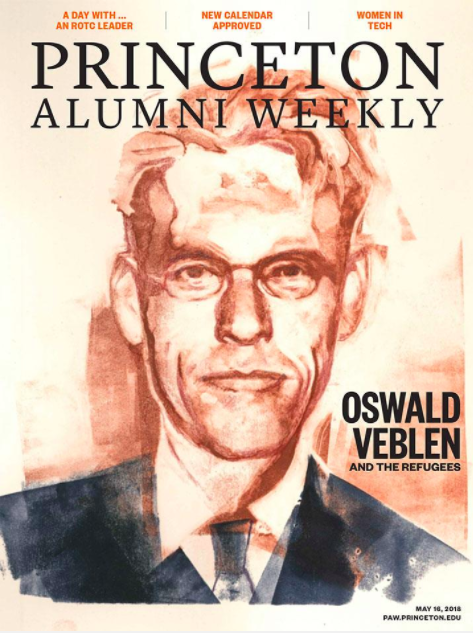 The cover story in the Princeton Alumni Weekly is the second article written by Elyse Graham about mathematics at Princeton, the first being "Adventures in Fine Hall" back in January, which tells of Veblen's role in designing Old Fine Hall, and also as one of the main architects of "math's golden age." That article offered an opportunity to write a letter to the magazine, and let Princeton alumni know about our work at Herrontown Woods. Still more about Veblen's mulitfaceted legacy can be found in a PAW article from 2012 entitled "Before Turing, There Was Veblen, " by Jon R. Edwards.